WORLD’S LARGEST FLOATING DOCK in the final stages of completion. Built in 1922 by Armstrong, Whitworth, for the Southern Railway, the Southampton floating dock has a lifting capacity of 60,000 tons. It is 960 feet long, with an overall width of 170 feet and a clear width inside of 130 ft 6 in. The total floor area of the dock is about 3½ acres. IN recent years, ships have increased considerably in size. It has therefore been necessary to build larger docks in which the giant ships may undergo repairs. Of the two kinds of dock, the graving, or dry dock, and the floating dock, many people prefer the floating dock because it is more flexible. A modern floating dock is nothing more than a huge trough-shaped raft formed of a hollow bottom and two hollow sides. To raise a ship, water is let into the bottom and part of the sides of the raft until the bottom has sunk below the level of the ship’s keel; then the ship is manoeuvred over the raft by hawsers until the ship’s keel and the raft’s keel blocks are exactly in line. Finally the water is pumped out and the raft lifts to the surface, carrying the ship with it. Where there is a considerable difference between high tide level and low tide level, a small ship can be floated close inshore at high tide, and will then be left high and dry when the tide goes out. But in waters where the difference between the high and low tide levels is only slight, it is necessary, before repairs can be done to the submerged part of the hull, to find some artificial method of getting the ship clear of the water. According to tradition, the earliest known form of floating dock was invented by an English sea-captain in the harbour of Kronstadt, in the Gulf of Finland, during the reign of Peter the Great. The English captain wished to repair the copper sheathing of his ship, and as there was no slipway or masonry dock available, he bought an old hulk called the Camel. This he gutted completely, removing the stern and fitting a water-tight gate in its place. He then warped his own ship inside the hollow shell thus formed, closed the gate and pumped out the water, thus leaving the underwater surfaces of his ship high and dry. A dock of almost exactly the same type was still in use at Wivenhoe, Essex, in 1936, and another similar dock at Rochester, Kent, is used for yachts. The first floating dock built and used in Great Britain was one built in 1776 by a shipwright named Aldersly. Then came Christopher Watson’s dock, built in 1785 and put into use at Rotherhithe on the River Thames. A print is extant showing the dock there in 1800, lifting the brig Mercury. WHEN ENTERING THE FLOATING DOCK a liner needs the assistance of powerful tugs. The White Star liner Majestic, at one time the largest liner in the world, 56,599 tons gross, is entering the floating dock at Southampton for her annual overhaul. The Majestic was 915 ft 6 in long, with a beam of 100 ft 1 in and a depth of 58 ft 2 in. She was taken out of commission in February 1936. TO RAISE A GIANT LINER above the level of the water the enormous dock can exert a maximum lift of 60,000 tons. In the lower picture the Majestic is shown docked at night in the world’s largest floating dock at Southampton. A large liner must be overhauled rapidly, and often more than 1,000 men work on her day and night while she is in the dock. It is uncertain whether Watson used an old ship or whether he specially built his dock, but the principle of these early docks was the same. They were simply shells provided with a gate at one end, into which the vessel was warped; the gate was then closed and the water was pumped out of the confined pound. Their useful life was surprisingly long. Watson’s dock is known to have been in active use for forty-four years, and probably its working life continued for several years more. The first improvement in the design of the floating dock was to make the walls and bottom hollow and thus buoyant. This gave two advantages. First, the heavy water-tight gate at the end, which was essential to the “pound” system, was eliminated; secondly, the stability of the dock was greatly improved. In 1809, Richard Trevithick and Robert Dickinson patented a design for a dock which they described as a caisson, to be built of wrought-iron plating half an inch thick and internally resembling a ship. CLEANING AND REPAIRING A FLOATING DOCK. The side walls of this type are built in sections. The section to be cleaned is detached and the two adjacent sections of the dock are turned round and sunk. The outer sections are then drawn closer together so that when they are lifted again the centre section rests on the projecting ledges of the outer sections and is lifted above the water. The shell was to be 220 feet long, 54 feet wide and 30 feet deep, with a large flange 6 feet wide extending outwards horizontally for the workmen to stand on and for additional strength. It was to be surrounded by semi-cylindrical water-tight chambers; and the raising was to be effected by a pump worked by a 12-horse-power engine in a barge alongside. A similar design was patented by G. W. Lennox in 1834; but neither of these designs was ever put into practice. The Americans were the first to put into practice a design for a hollow dock. They built their earlier docks of timber. The first of any note was that built for the Navy Yard at Portsmouth, New Hampshire, in 1848. Hollow-walled wooden docks continued to be built for some years, and were of large size. One at Rangoon, built in 1866, was more than 300 feet long. So far, iron had not come into general use for the building of floating docks. Several designs for iron docks had been patented, notably one by James Taylor of Birkenhead in 1852. In this design the floor was divided into four separate compartments. Pipes from these compartments led to pumps separately controlled, the trim being maintained by further compartments in the side walls. But it was not until Edwin Clark, in the early ’fifties, designed the hydraulic lift dock that iron began to be freely used. The design was a departure from previous practice, since the rectangular iron pontoons of which the dock was formed depended for their lift, not upon pumps, but upon a range of hydraulic rams embedded in immensely heavy foundations at the bottom of the harbour. The method of working was first to admit water to the pontoon so that it sank on to the ram heads, then to float the ship over it, lift pontoon and ship high enough to allow the water to run out of the pontoon, close the pontoon valves, and finally release the rams, leaving the pontoon floating with the ship on top of it. The disadvantages of the arrangement were the high initial cost and the relatively small capacity. The hydraulic gear had to be provided with foundations nearly equal in strength to those of a masonry or graving dock. Docks of this type - now obsolete - were installed at Malta in 1871 and also at Bombay in 1872, but the best-known example was the Victoria Dock, London, built in 1857. The first Bermuda dock, built to the order of the Admiralty in 1868 for use by the West Indies Squadron, is an interesting example of a hollow-walled iron dock depending for part of its lift upon the pumping dry of compartments contained within the walls themselves. The walls contained twenty-four watertight chambers which could be emptied by eight steam-driven pumps mounted on top of the dock walls, and these when empty exerted a lift of 3,000 tons. An additional lift was obtained by the time-honoured device of a pound formed by closing the ends of the dock with gates. SELF-DOCKING. Each figure illustrates the process of self-docking a section or pontoon of a floating dock. In Fig. I a section is turned end-on and lifted on to the others. In Fig. 2 the overlapping pontoon sections form ledges on to which the required section is floated. In Fig. 3 only the pontoons are in sections, the side-walls being continuous. In Fig. 4 the pontoons, besides being attached to the side-walls, are themselves joined together. Fig. 5 illustrates the principle operating in the photograph above. Most of the floating docks built up to this date were of the kind classified as box docks; that is to say, they were built all in one piece. This method of building gave rise to the quaint difficulty that the docks themselves could not be docked, being much too large to go into any masonry dock. In a landlocked bay or warm tropical waters, the deterioration or fouling of the underwater surfaces soon necessitates repair. CHRISTOPHER WATSON’S DOCK was built at Rotherhithe on the Thames in 1785. This drawing, taken from a contemporary print, shows a stern view of the brig Mercury in the dock. The first floating dock in Great Britain was built in 1776. In the Bermuda dock it was hoped that the U-shaped design would solve this problem by enabling the dock to be careened. The compartments on one side would be pumped dry and those on the other kept filled until the dock was canted sufficiently to show its bottom clear of the water. When the exposed half had been attended to, the process would be reversed. To get at the bottom, however, the dock had to be canted so far that there was grave danger of its capsizing. As this had nearly happened once at a trial in Portsmouth Harbour, no further attempt was made. Eventually the dock became so foul owing to the impossibility of cleaning, that it was decided to fill in the floor and part of the walls with concrete and to use the dock as an ordinary graving dock. The difficulty experienced in cleaning the underwater surfaces of floating docks led to the introduction of the self-docking principle. The first and simplest method of carrying this out, which was based on the system adopted for the early timber sectional docks of America, was to build the dock in several small sections. The length of each section was less than the clear width between the side walls, so that any section could be turned end-on and lifted on to the others (see Fig. 1 in the diagram above). In a variation, the sections were made of any convenient length provided that there were at least three sections in the whole dock. Every section had its pontoon portion somewhat longer than the walls so that the deck formed a ledge at either end. When it was required to lift a section, two others were sunk and the section to be lifted was floated over these ledges; as the submerged sections were pumped out they lifted the middle one clear of the water (see Fig. 2, above). The great disadvantage of these sectional docks was their lack of rigidity. The sections were joined together merely by lashings or timber-bolts or by some more or less flexible form of coupling, so that the dock was not a rigid whole, but was built up of separate units loosely coupled together. It follows, therefore, that there were risks, first of straining the ship through uneven pumping, and secondly, of the connexions breaking. Many accidents have been due to the end pontoon bodily slipping from under the vessel’s forefoot. In one instance, this almost caused the destruction of the dock, an old timber one. 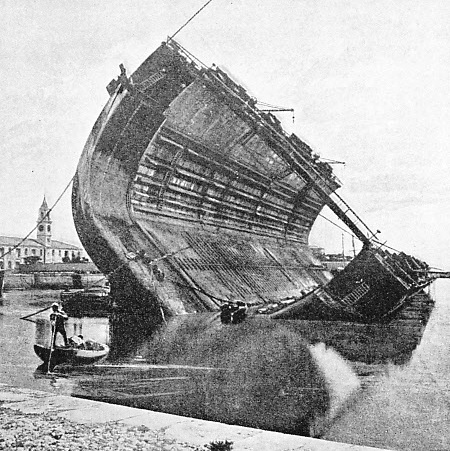 When the section slipped out, the extra weight thrown on the next section was sufficient to cause it to collapse, and the vessel then launched itself end-on, smashing most of the remaining sections as it did so. A great improvement on the early sectional docks was introduced by the great engineer Bennie in his Cartagena Dock, built in 1859. In this form, classified as the sectional pontoon dock, only the pontoons forming the floor of the dock are in sections, the side walls being continuous. The side walls rest on the upper surfaces of the pontoons, to which they are attached by heavy fishplate joints, lugs and taper pins. In self-docking, any pontoon requiring repair is unpinned from underneath the side walls and sunk sufficiently to enable it to be withdrawn. Then the remainder of the dock is sunk, the section turned half round and floated in and the whole raised (see Fig. 3, above). Although the longitudinal rigidity of the sectional pontoon is vastly superior to that of the old sectional docks, yet it is not sufficient to obviate entirely the risk of accident. Since the pontoons are not connected in any way the whole resistance to bending must be taken by the walls alone. These docks have often had their decks buckled while lifting short and heavy vessels or they have been badly damaged through working in a seaway. 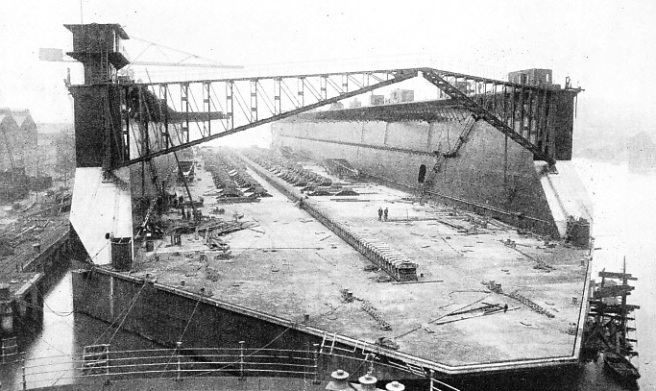 In the summer of 1903 a dock of this type, of about 8,000 tons lifting capacity and 436 feet long, had its back almost broken through during a gale in the English Channel, and the pontoons were permanently altered in shape. THE FIRST BERMUDA DOCK was a hollow-walled iron dock built in 1868. Twenty-four compartments in the walls were pumped dry by eight steam-driven pumps to give the dock a lift of 3,000 tons. To tilt the dock for cleaning purposes, one wall was pumped free of water and the other wall was kept filled. This practice had to be abandoned because there was grave danger of the dock’s capsizing. For many further improvements which have taken place in the design of floating docks during the last fifty years, Clark and Standfield, the Westminster firm of consulting engineers, have been almost entirely responsible. In 1895 they greatly increased the longitudinal strength of floating docks by their “Havana” design. In this type of dock the pontoons, besides being attached to the side walls, are themselves fastened together by means of fishplate joints. The depth of the walls is extended to the full depth of the pontoons, and the walls are attached, not to the upper, but to the outer surfaces of the pontoons (see Fig. 4, above). For self-docking the walls, the dock is merely heeled over to one side or the other, only a slight angle of heel being needed to expose either wall completely. For docking the pontoons, the fishplates are disconnected and the pontoon to be lifted is allowed to float free. Then the remainder of the dock is sunk to a certain depth, the detached pontoon is reattached to the side walls at a higher level and, on the dock being pumped out, the pontoon is lifted clear. Of this Havana type the best-known example is the second Bermuda dock built by Swan, Hunter and Wigham Richardson of Wallsend-on-Tyne in 1902 to replace the old U-shaped dock of 1868. The new dock is 545 feet long and has a width of 100 feet. It affords also a good illustration of the tendency towards increased use of the pontoons and the decline of the pound for lifting purposes. The lift given by the pontoons was 15,500 tons, but the additional lift provided by the pound was only 2,000 tons. From this time forward, gates at the ends of the dock were seldom fitted. Rigid as the Havana type proved itself to be, the demand for a still more rigid form of dock has been made. This led Clark and Standfield to design the bolted sectional or sectional box dock. This is a reversion to the old type of sectional dock. The difference in the new type is that the sections are rigidly bolted together, thus forming a continuous trough-shaped girder of enormous strength. The two terminal sections have pointed ends. In self-docking any one of the centre sections, that section is unbolted. The two remaining parts of the dock are turned round and sunk and their pointed ends are drawn underneath the centre section as far as they will go. Then they are pumped dry and the centre section is lifted on the pointed ends (see Fig. 5, above). When a terminal section (which is pointed) is lifted, the dock is divided into three and the pointed portion of one lifting section is passed under the square portion of the lifted section. The rectangular central section is then lowered and backed in, so that the pointed portion of the lifted section enters between its walls. This method of self-docking has certainly not the simplicity of the operations required for the sectional pontoon or the Havana types; but self-docking does not often have to be undertaken, so that a longer period may well be allowed for the operation if more important advantages are thereby gained. The Southampton dock, built to this design by Armstrong, Whitworth for the Southern Railway, is the largest floating dock in the world. It has a lifting power of 60,000 tons. The length is 960 feet, the overall width 170 feet, the clear width inside 130 ft 6 in and the depth of the floor 20 feet. The draught over the keel blocks, with the top of the side walls 6 ft 6 in out of the water, is 38 feet. The complete weight, including fittings and machinery, comes to about 19,000 tons. The total area of the floor is about 3½ acres. Some 3¼ million rivets have been put into the dock, and approximately 7½ million rivet holes have been either drilled or punched. The dock is in seven sections and each section is provided with its own pumping machinery. A centrifugal pump at the bottom of the dock, operated through vertical shafting by an electric motor situated in a house on the top deck, is installed on either side of each section, so that there are fourteen main pumps and as many motors. The control of these various units is completely centralized. The valves and pumping motors are operated electrically by means of a push-button system in a single valve-house situated on top of one of the walls. Gauges record there the depth of water in the different compartments of the dock while flooding or pumping is taking place. TOWING OUT OF A FLOATING DOCK. 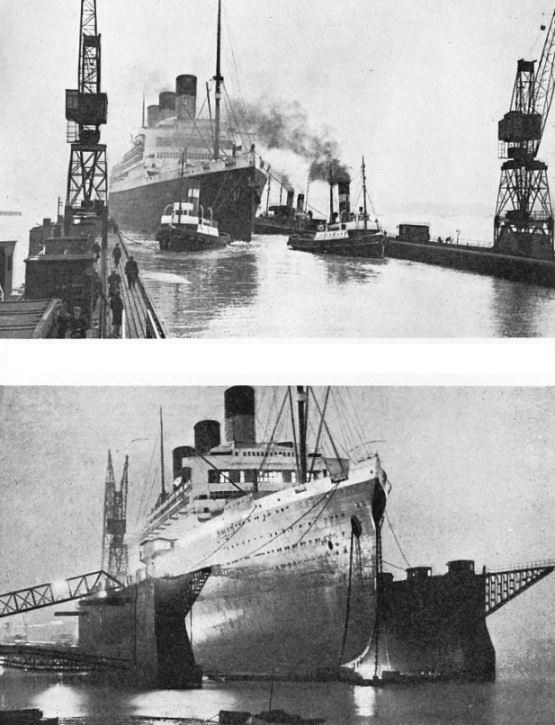 Southampton saw the world’s largest liners in the world’s largest floating dock before the advent of the new graving dock. 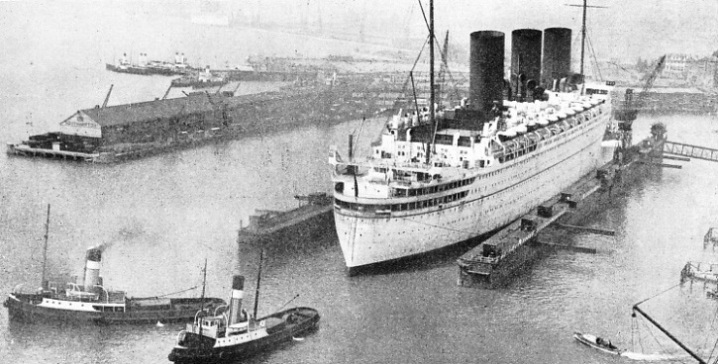 Above is the Empress of Britain, a famous Canadian Pacific quadruple-screw liner with a gross tonnage of 42,348. The various apparatus for the control of the dock is installed on two tables, about twenty feet long, placed in the valve-house. These tables form together a model of the dock, and the control apparatus corresponding to each section of the dock is mounted in its appropriate position on the tables. An electrical device indicates with lamps when the ship’s keel lies centrally on the keel blocks, and similar devices installed in the valve-house or near it enable the dockmaster to observe the deflection of the dock and its inclination in either direction. A complete telephone service connects this house with every motor-house on the dock. There is thus concentrated in the valve-house all the necessary gear to enable the dockmaster to exercise complete control over the dock’s machinery during the operation of sinking and raising the dock. He can observe from the instruments under his eye exactly what is occurring and can readily make the needful adjustments. At the official trial, this dock lifted the Olympic, of 46,439 tons gross, in three hours fifty-two minutes. Some 80,000 tons of water were discharged from the dock’s compartments during the operation. Interesting developments of the floating dock are the “off-shore” and “depositing” docks. The off-shore type was intended for use in fixed positions near the shore. The advantage is that the outer wall can be dispensed with, for stability is assured by mooring the inner wall to the shore by pivoted girders which allow the dock to rise and fall while it is kept in a horizontal position. The depositing dock was developed by Clark and Standfield in 1876 for the purpose of docking Admiral Popoff’s circular ironclads in the Black Sea. These vessels, one of which is illustrated on page 546, were so wide that no conventional dock could accommodate them. The dock consists of a series of long hollow fingers connected to a hollow wall. Along the shore a staging or gridiron was built, the spacing between the grids corresponding with the spacing between the fingers of the dock. The method of working was to lift the ship in the usual way, tow the dock with the ship in it sideways to the staging so that the fingers of the dock and the grids of the staging interlaced, and then to sink and withdraw the dock, leaving the ship deposited on the staging. The advantage was that, besides accommodating ships of unusual width, the same dock could be used to deposit any number of ships on further lengths of staging. Examples of these depositing docks are still to be found at Nikolayev and Vladivostok, in Russia, at Barcelona, in Spain, and at Kobe, in Japan. The dock at Kobe was built chiefly for the purpose of dealing with gigantic monoliths of reinforced concrete, weighing up to 6,000 tons, of which the quay wall was being built. One of the most valuable characteristics of the modern floating dock is its mobility. It can be built at the cheapest place and moved to the scene of its intended operation. The earlier docks were shipped out in pieces and the final assembly was done on the spot. L. Smit and Company’s Internationale Sleepdienst, of Rotterdam, has the greatest number of these passages to its credit. Its tug Zwarte Zee, 793 tons gross, is one of the most powerful tugs in the world. The towing gear generally used is extra superior Manila rope of 18 to 20 in circumference, with a bridle of 6-in. Bullivant steel wire on either end to take the chafe on the bollards. Yet, even with gear as strong as this, the enormous area which the sides of a floating dock present to the wind makes towing in heavy weather impossible. The dock has to be cast adrift to look after itself, while the tugs stand by it until the weather moderates. During the voyage of the Durban dock in 1903, bad weather encountered in the South Atlantic made towing impossible for two days, and the dock drifted for eighty miles before the tugs could attempt to take it in hand again. The largest dock ever towed a long distance is the 50,000-tons dock built by Swan, Hunter and Wigham Richardson for the British Naval Base at Singapore. The dock was towed out 8,500 miles by L. Smit and Company in 1928. Seven tugs took the dock out in two sections. Beyond a slight straining of the dock’s end plates due to heavy pounding in the Indian Ocean during the monsoon, no accident occurred. The longest tow of this kind was that performed by the tugs Zwarte Zee and Witte Zee in 1931, when they took a 17,000-tons dock from the Tyne to Wellington, New Zealand. This wonderful voyage of more than 12,000 miles occupied only 166 days. The Zivarte Zee of 1931 was replaced in 1933 by a new motor tug of the same name, referred to above. END OF A 12,000-MILES TOW at the entrance to the harbour of Wellington, New Zealand. The 17,000-tons floating dock was towed from the Tyne to Wellington in 1931 by the tugs Zwarte Zee and Witte Zee. The voyage occupied 166 days, and was one of the longest tows on record. The Zwarte Zee, which in 1933 was replaced by a more powerful motor tug of the same name, had an indicated horse-power of 1,503.